Beginner's Guide to Creating Manga Art is a more of a tips and techniques book rather than a structured course on drawing manga from start to end. The book covers only characters. It starts with lessons on features, expressions, anatomy, poses, clothing and character designs. The lessons are brief and are covered under 30 pages. For example, for drawing of heads, the front and sides are taught. But for heads at other angles, while there are illustrated examples with guidelines, there aren't enough in depth explanation to go with it. This section is just an introduction on figure drawing. The second part of the book features tutorials from various artists on designing characters. There are many useful tips on drawing, what type of materials to use and things to look out for. Many artists are using traditional medium but there are a few tutorials on Photoshop. The third part is on colouring the characters that were drawn in the previous chapter. The tutorials cover a variety of tools that are used, such as coloured pencils, markers, watercolour and Photoshop. Again, there are good tips on handling the specific mediums. The last few pages feature a manga art gallery from various artists. 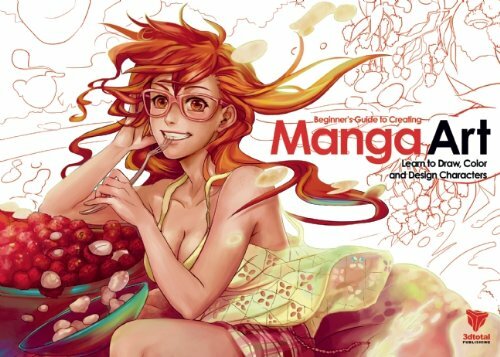 Overall, this book is more on understanding the style of manga art, and the tutorials that show you how to create them. For beginners, I would also recommend getting dedicated books such as Drawing the Head and Hands and Figure Drawing for All It's Worth. With basic figure drawing skills, stylizing characters for manga will be much easier. Is there a book like this one but for comics not manga? Thank you and keep up the great work you are doing with this blog. I will come back and read your reviews.